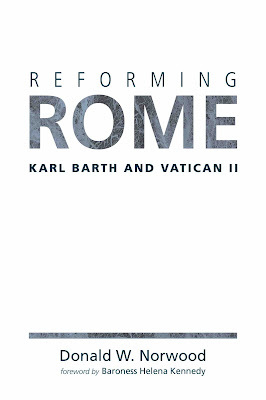 At 232 pages of text Reforming Rome is not a long book, but its 25-page bibliography is suggestive of its compact comprehensiveness. It is hugely instructive and illuminating about Vatican II, not only in terms of input and output, but also as an event. That is, it not only provides a description and analysis of the Council’s work, it also gives a vivid sense of the Council as a kind of huge ecclesial gala for gift-exchange, as much about relationships as ideas. How delightfully Norwood weaves into his narrative snippets of the personal interactions of members and guests, before and after the Council as well as during it. Thus Vatican II becomes a model for the way to do our ecumenism today: unity-through-friendship. Which doesn’t mean that we must always be nice to each other, let alone agree with each other, but it does mean that we will always have each other’s backs. Enter the ever polemical Karl Barth. From the first volume of his Church Dogmatics when he (in? )famously declared that the analogia entis, the ontological foundation for doing natural theology, is “the invention of Antichrist,” Barth was always up for a theological punch-up with Rome. Until the (school) bell, that is, when many of his Catholic interlocutors became beloved companions (particularly the two Hanses, Urs von Balthasar and Küng). Indeed for all his tenacious cross-examination of the Council’s documents – he lamented the failure of Nostra Aetate “to set forth an explicit confession of guilt” for the Church’s historic anti-Semitism; dubbed Dignitatis Humanae a “monstrosity”; and remained underwhelmed by even the moderated Mariology of Lumen Gentium – Barth was a dedicated evangelist for Vatican II, convinced in his dotage that there were now no “irreconcilable differences” to block the eschatological not-yet of unity from becoming ever more realised. Other areas of contemporary as well as historical interest covered by Norwood – “The past is not dead; it is not even past,” wrote William Faulkner – include the excellent section devoted to the question of women (Barth told Rome that it still has work to do; women told Barth that he still has work to do too! ); an update on why the doctrine of justification by faith should no longer be considered a church-dividing issue (though in my view the 1999 Catholic-Lutheran Joint Declaration on Justification by Faith might be even more of an ecumenical game-changer had insights from the “New Perspectives on Paul” on the ecclesiological import of the doctrine informed the biblical studies done by its working party); and the parts that touch on polity, hierarchy, and the purple elephant that won’t leave the building, i.e., episcopacy (Barth, I sense, would support the ecumenical consensus about the threefold ministry, as long as there are laocratic checks and balances to the exercise of episcopal authority). 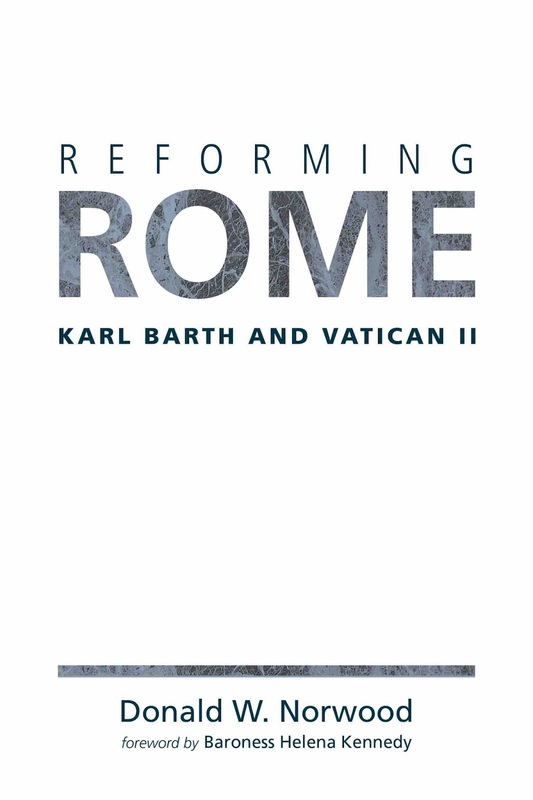 Reforming Rome is a must-read for anyone interested in Vatican II, in Karl Barth, and for all engaged in current ecumenical discussions, not least for the contagiousness of the author’s unquenchable enthusiasm for visible unity. In the book’s acknowledgements, Donald Norwood writes that “without the support of my lovely wife Margaret, I could not write another word.” To which uxorial praise I would only add: Margaret, stay healthy!